Hi, I’m Kirstie, owner of Signature Hair by Kirstie. I am a Bridal and Occasion Hair Specialist fully qualified and completely devoted to creating bespoke hair designs from the comfort of your own home or venue. I’ve worked in the hair industry for over 10 years, initially being salon based where I gained huge experience and met lots of great clients who have remained friends and clients since leaving. In 2018 I was awarded Runner Up in the Confetti Awards for Wedding Hairdresser of the Year. I finally decided it was time to take the leap and begin Signature Hair by Kirstie in January 2014 and I can honestly say it was the best decision I have ever made. I wanted greater flexibility in my working life, and felt I could really do something special in the wedding industry. Everyone raved about my style and the results I produced, and looking back I guess that gave me the encouragement and confidence to establish the business. I love every part of my work – how could I not? 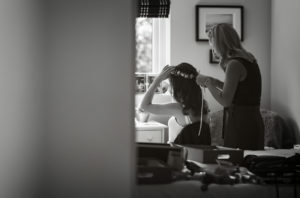 From meeting my clients to chat about how I can help them, to enjoying the wedding hair trials in the lead up to the big day, to finally spending the most magical morning of a woman’s life with them, making them feel incredible, I love it. Plus, I get to work around other fantastic suppliers, a bit like an extended family. Although based in Innerleithen in the beautiful Scottish Borders, I deliver UK and Destination wedding specialist bridal hair services. I absolutely believe every bride should feel their most beautiful on their wedding day and like the name “signature” implies, every style is tailored to your exact wishes and requirements. I take so much pride in my work and customer service. If you haven’t had a chance yet, take a look at some of my work in my Style Gallery. And perhaps take a moment to read some of my reviews. These will give you a feel of how I work on the day. With a group of existing clients, many now good friends, I am also able to balance my general hairdressing services and make time for commercial photo shoots as and when required. Let me create your perfect wedding hair experience from the very first email right through to your wedding morning.